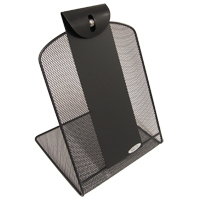 Use the Ultimate Document Holder to free up your desk space! 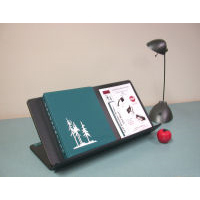 This product allows you to position documents and books so you no longer have to twist your neck. When mounted on one of the recommended arms (sold separately) it provides 16" of vertical and 24" of horizontal movement, yet folds out of the way into a mere 3". Repositioning of the easel can be done easily with one hand. 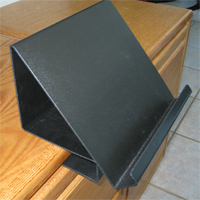 The easel is composed of 3/8" ABS plastic with an extra-deep ledge for holding books, large stacks of paper and even 3" binders. Note: Price shown is for easel only, please select the desired arm at right in the drop down menu. 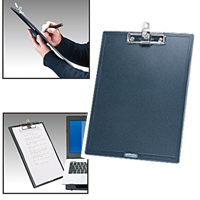 Aidata's new Clipboard Stand is designed with practicality and convenience in mind. It incorporates a rotating hand-grip that doubles as a desk stand, enabling the clipboard to perform equally well as a desktop copyholder. The convenient hand-grip rotates a full 360º, permitting use in both portrait and landscape orientations, available equally for both left and right-handed users. Angle adjustment on the hand-grip enables positioning for optimum viewing angles. The spring-loaded document clip includes a coiled spring pen/pencil holder that eliminates the common cords or missing writing utensil. A convenient hanger on the clip permits the clipboard to be wall-hung for easy access. For those who prefer a traditional copyholder the ergonomic hand anti-slip rubber grip ring can be removed via a simple click in/click out function. 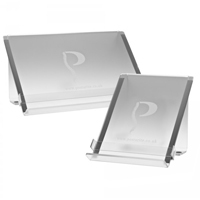 Available in two compact yet versatile sizes, the SlideRite Document Holder can be used anywhere on the desk surface, as well as inline between the keyboard and monitor. The SlideRite is made of tough, frosted acrylic, and is fitted with a removable line guide to help users navigate through pages of text. 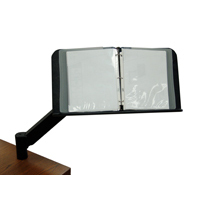 The SlideRite holds documents at a stable 50° angle for comfortable viewing. The Standard SlideRite is 8.7" wide by 8.5" high by 9.4" deep. The Large SlideRite is 17.5" wide by 9.3" high by 9.4" deep and can hold two letter-sized documents side by side. 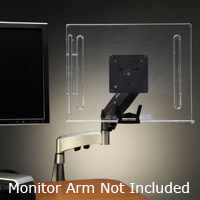 The Clean-Doc is an in-line document holder that mounts to any standard VESA compliant LCD monitor arm. Organize your papers and create more desk space while reducing head, neck and eye movement. 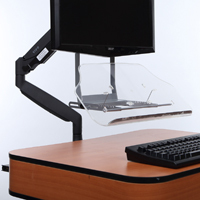 The clear acrylic easel with pen holder can be used to store keyboard and mouse when not in use, and the storage position of the easel improves the efficiency and thoroughness of cleaning the desk surface. Ledge tapers to outside edges, 0.4375" deep at center. When in use the Clean-Doc must rest on the desk surface while leaning back against the support bracket. Storing the Clean-Doc is accomplished by lifting the front edge until the unit is horizontal and sliding it into the support and storage bracket. The Clean-Doc is a document holder and is not intended as a writing surface. NOTE: When in use the Clean-Doc must rest on the desk surface while leaning back against the support bracket. 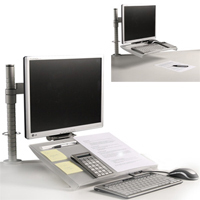 The document holder platform CANNOT be suspended under the monitor in a higher position. 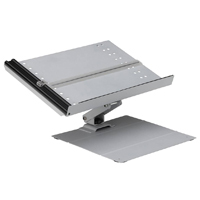 The Vu Ryte 59GR Inline Document Holder mounts in conjunction with a monitor on any VESA-compatible monitor mount, keeping documents directly in front of users regardless of the position of the monitor. This helps to reduce neck and upper back strain caused by constant movement of the head (which occurs when users are viewing documents placed flat on the desk or to the side), and to reduce elbow and shoulder strain caused by overreaching when repositioning reference materials. By attaching directly to the monitor arm, the VUR-59GR moves in tandem with the monitor, making it suitable for use even with sit/stand monitor arms. In addition, the VUR-59GR optimizes workspace by floating above the desk, thereby allowing other desk tools to be brought into the user's comfort zone. The VUR-59GR is adjustable in height, depth, and angle, and can be reconfigured to support documents ranging in size from envelopes to 8.5" x 11 papers. Note: The 59GR does not easily accommodate legal-sized or larger papers, and is not designed as a writing surface.